I must admit, hearing that the Minnesota Vikings already gave up on Randy Moss after four games was pretty comical. For the 13 catches, 174 yards, 2 TDs, and one hilarious press conference that Moss generated, Brad Childress gifted old friend Bill Belichick with a third-round pick. And the worst part for Chilly was that the Vikings only won one of those four games. But don't laugh too hard at Minnesota's generous ways with valuable draft picks. Something very similar happened in our own backyard yesterday. You may recall the name "Thaddeus Gibson". Gibson, a linebacker, was a fourth-round pick of the Steelers in the 2010 draft out of Ohio State, and signed a three-year deal worth $1.58 million, including a $366,000 signing bonus. He hasn't suited up for the Black and Gold yet this season, but the team was allegedly happy with his development, knowing that he was somewhat of a project when they drafted him. Unfortunately, Gibson plays a position that's very well-stocked on the Steeler roster. The team is pleased with the progress of fellow rookie LB Jason Worilds, and they needed to sign a defensive lineman to help a unit decimated by injuries. So in comes DE Steve McClendon, out goes Gibson. It was a calculated risk that no one would sign Gibson off of waivers, a risk that backfired on the Steelers yesterday. Both Philadelphia and San Francisco put in claims to sign Gibson, and he was awarded to the 49ers by virtue of their lousy record. That's all well and good that the Steelers are deep at linebacker, so why take another one so high in the first place? Is this team so well-stocked at other positions that they can take a flier on yet another linebacker, when they already boast arguably the best unit in the game and another high pick (2nd round) in Worilds? Usually I'm down with the Steelers' personnel moves, right down to dumping Santonio Holmes. But there's no doubt that they blew it on this one. We can laugh at the Vikings all we want (and we will, trust me), but this was crummy maneuvering and wasteful drafting by the Steelers. They're better than that. 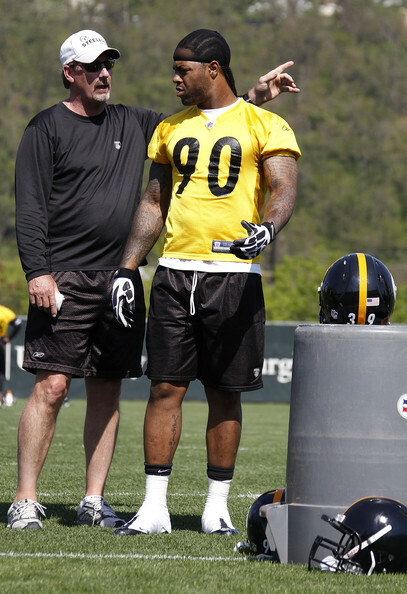 And for those of you saying, "It's just a fourth-round pick," here are some Steeler fourth-rounders of years gone by: Dan Sepulveda, Willie Colon, Ike Taylor, Larry Foote, Aaron Smith, Deshea Townsend, and Earl Holmes. It's not a throw-away pick, and shame on the Steelers for treating it as such. They should have never taken Gibson in the first place. I have trouble ragging on this organization for failed draft picks. They do a pretty damn good job. Can we at least wait until Thaddeus Gibson makes his first NFL tackle? Comparing a guy who has never played a down to other draft picks from the same round is a bit much. I mean, every guy drafted in the 6th round or whatever is constantly compared to Tom Brady. But how often is somebody going to measure up. There have been first rounders who failed and undrafted free agents who have worked out extremely well. It is ALWAYS a crapshoot. So Thaddeus Gibson is waived, our #1 pick this year is starting and is an absolute beast, so they knew what they were doing there. Worilds has looked solid as well and he at least PLAYS. Gibson couldn't even "get a hat" so far this year. There is a reason for that and for a guy who is a project, I would rather take the chance of A-Smith coming back. I can think of some other projects, like Alonzo Jackson, that didn't work out. And I am sure there are some projects who did. Ahhhh! We lost a game! Let's freak out about everything! However, you look at ANY draft for ANY team (aside from the steelers in '74)... there's gonna be hits and misses. It's waaayy too early to call anyone either, but pouncey, sanders, sylvester, & brown certainly look legit. @ Vinny Tremblay - i'm sure if you look at other players in those same drafts, there's plenty of steals too. Every draft is a crapshoot... there's steals and busts all over the draft board. And we can't 'wait until thaddeus gibson makes his first tackle'. Who would you bench to allow him to dress on gamedays? Or better yet, who would you rather have released? I have zero problem with Gibson's release yesterday. Could we have spent the pick more wisely? Probably... but that's the nature of the NFL draft/combine. Being critical of drafting Gibson is misguided in this situation because the causal chain of events does not reach your conclusion necessarily. The decision to keep Smith on the roster in order to ensure he has a chance to play again this year comes at the cost of a healthy body being waived if we want to replace him at a positional level on the roster. The decision was made to add another defensive linemen in hopes of improving its effectiveness and in doing so we have to accept the cost that someone has to go. It happened to be gibson but as you suggest it didn't have to be. If we would have taken an NFL ready DE, our boys would have looked like geniuses, fortunate victims of circumstance. They could have taken a safety, corner, running back, receiver in this fourth spot and waived him in this situation because linebacker would no longer be an obviously heavy position and defensive line still one of need. There is no necessity in saying that if you don't draft Gibson we are not sitting here today talking about a waived 2010 draft pick. I think given the situation and its circumstances Gibson had the least to offer this team in the present, which was not the case present in the situation and its circumstances on draft day. Why not waive Charlie Batch and take your chances that nobody claims him? @real, i think that's the sentiment - was there no one else to cut? @ Real McCoy - Hahaha, that's the best idea i heard all day! Although, i think if Batch were to be cut, he wouldn't be eligible for the practice squad. But, really, if chuckie batch isn't on the roster anymore... who really gives a flying fudge factory? Upon further review, Batch is the ONLY person on the roster i would agree should have been cut over Gibson. I think they can't cut Batch because of the QB depth issue. Look at the injuries we had before Ben's suspension. We know Ben takes lots of hits and has missed the occasional game to injury. I don't know all the NFL regulations about roster moves, but that's a thought as to why they wouldn't mess with the QB group. Do you have any reason to believe that player wouldn't likewise have been waived under these circumstances? What you're really suggesting is that this wouldn't have hurt nearly as bad if the Steelers had selected some hack that two other teams weren't interested in. Your idea of value is apparently having someone around to at least hold a blocking dummy on the practice squad. The fact that two teams put in a claim for Gibson is evidence of the Steelers' drafting prowess. There's only 53 roster spots, so unless you're suggesting that the Steelers should have placed Aaron smith on the IR, or some other similarly insightful suggestion, chill with the criticism.